When I first got on Instagram, a friend dutifully warned me that it was the place for shallow people, mostly celebrities and celebrity-wannabes, social climbers, those with a materialistic bent. So I tread carefully for a while, until one day, WHOA. So many Catholic women! Fellow homeschooling moms, sisters, singles, sharing a bit of their world and their faith with every picture. I met Christina online via homeschooling moms, and then in person last year, when we bought our veils from her. She has such an eye for beauty, so when I saw her personalized Bible covers on IG, done with so much love and thought and attention to detail, I knew we had to feature her work here at PinayVoices. PV: Tell us about yourself, Christina. What inspired this whole Bible art thing? What got you started? I’m Christina Saccharine Santos Mamaril. I’m a third culture kid, Filipino by blood, born and raised in Dubai and now living in America. I’m an absolute Beauty seeker. In 2013, I went to study Theology of the Body with Christopher West after a breakup which was apparently God’s intervention. Not only were my wounds exposed and brought to the light but it started me on this path which allowed Christ to kiss my wounds one by one and bring me wholeness as a woman. One of my wounds was the about not being good enough as an artist. I stopped painting ten years ago because being an artist wasn’t a lucrative profession. Having let go of that opportunity to study it in the past, I came to a point where the desire to create art was there but my fears and insecurity told me that I wasn’t good enough. There were way too many creative people, better than me, that had more skills and work to show than me. So I locked away the desire to be a co-creator with the Master Artist because it was just too painful. When I moved to America abruptly early this year, I had difficulty finding a job and I was in despair. Because of the lack of money and my embarrassment of asking, I tried to find a creative way to earn. 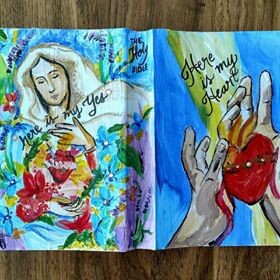 I was in Instagram and I was inspired by this artist at Hosanna Revival who was painting Bible covers, but I was too scared to go back. But I remember this nagging feeling in me, like a familiar feeling of being in love and on a high when I used to paint in High School. So I took out my old paints and decided to try. I was going on another Theology of the Body retreat in the coming weeks and I decided to bring samples there. I even remember being so embarrassed to ask the organizers if I could tell people about what I do. But I brought that self doubt to God and told him to speak to me clearly if this was what He wanted me to do. On the last day of my retreat, I got my first official order and it has never been the same since then. PV: Could you tell us about your “process”, like how you begin a personalized Bible cover, from start to finish? The process is very personal. When someone orders from me, I start praying for them and what God wants to tell them. We have several conversations brainstorming but I always know that it isn’t me at work because there are times I’ve run out, and then God will bring images in my mind the night before I begin painting for that person. Or He’ll send me something to inspire me or He’ll whisper something subtlely in the strokes or in the colors or in the conversation with the buyer. I’m not a trained artist so to be honest I have a lot of references. I take pictures of pretty skies, gnarled trees, friend’s hands. Sometimes I’ll scan Pinterest or read excerpts of the theme I have in mind. Then I make a super rough sketch and mind map recalling my conversation with buyer and the possible things I want to put on the cover. When I’m done painting, which usually takes 4–6 hours depending on the design, I send a picture to the owner for last revisions, then I coat it and mail it with a tiny note. PV: I’m sure our readers would love to see samples of your work. Tell us more, please. 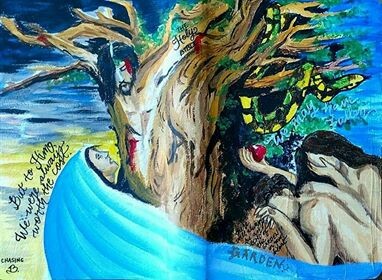 In the front cover of Alex’s Bible I put a very shameful Adam and Eve. Eve is stretching out her hand still holding the fruit because just like us, she keeps holding onto her sin when she and Adam can just ask God for forgiveness. The serpent dangles on top of them consistently reminding them of their moment of weakness and lying about what kind of Father they had. The faces of Adam and Eve are blank because in their sin, they lost their name, face and identity as a child of God. On the back cover, I put the New Adam and New Eve. The symbol of our redemption. Jesus is nailed onto the tree, like His wooden cross. And His mother, full of sorrow and anguish stands by Him. Mary’s blue veil flows and extends into the front cover because Jesus’ self-sacrifice wins redemption for Adam and Eve and Mary in her motherly compassion extends her embrace to them. Jesus attains for Adam and Eve again, and for the rest of us an even sweeter name and identity as His adopted brothers and sisters to a good, good Father. Jordan is a lovely young lady who loves life and our Blessed Momma. She gave me a lot of saints to pray with but when I was praying for her the Immaculate Heart of Mary was a constant image in my mind. It was funny because she sent me the image the same day to give me ideas. In the front I put Jesus’ hands outstretched and offering His most Sacred Heart. The crowns around it, pierced and bleeding so much so that the blood from His heart mingles with the blood from the wounds on His hands. I did this to show that Jesus offers the whole of Himself to us every day. He freely gives of Himself to us even to the point of death. He wants us to experience true love, one that we cannot even imagine in our human capacity. The words “Here is my heart” is to give the feel of a Lover, a Bridegroom who invited their beloved to be open to His gift. On the back cover, our Blessed Mother Mary, whose perfect Yes attained for us a Savior, and it is her “Yes” that we are called to imitate every day of our lives. I filled the back cover with flowers to depict beauty but how her “Yes” has caused her to stand out anong the most beautiful of flowers. Then I put her most Immaculate heart surrounded by a crown of thorns. This is to shows that her “Yes” had a cost as well, and it pierced her whole being to do so. I added tiny gems on the Bible to serve as a reminder to Jordan of the gem that she is. Grant gave me the story of Peter walking on water to reflect on. He had been pierced by an image that @billdonaghy had presented to us of Jesus reaching His hand into the waters to get a hold of a doubting Peter. 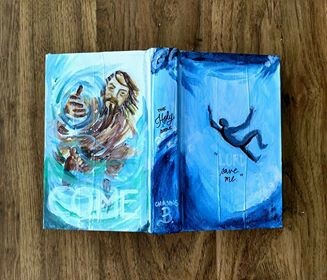 On the front cover of Grant’s Bible I painted a man falling into the depths of a turbulent sea. While the blues can make it look calm, in the time of the Old Testament, the sea was viewed by people as a place where evil dwelled. And this image is a reminder that we as humans beings can sink so low into the depths of sin, temptation and despair hence we should never be complacent in our prayers. The words of Peter, “Lord, save me” struck me and I wrote it to serve as a simple default prayer for Grant to hold onto. “Lord, save me” — from myself, from those who harm me, from the Evil one. It applies to everything. On the back, I used Yongsung Kim’s art work as an inspiration. It shows Jesus reaching out His hand to rescue a doubting Peter. His face is radiant and reassuring and He calls us to “Come”. I wrote the word “Come” in white — subtle and almost unreadable because sometimes God’s voice is like that. It isn’t out right, and it calls us to seek Him, only for us to find out that He has been waiting for us to accept His invitation all along. When I was praying for Karista, God led me to the concept of the Creation of Woman. The image of the Father is clothed in the colors of blood and water that represent Jesus Christ, and on the other side I used the colors of the sunrise to represent the Holy Spirit. The Holy Trinity comes together and creates. The woman wears a white veil that flows along with the wind, which also represents the movement of the Spirit within her. The white veil represents that she has to first desire to be the Bride of Christ first before desiring to be the Bride of the man God has prepared for her. I veiled the woman because I believe that what is beautiful and sacred is veiled, so even more so the woman is veiled and only will she be unveiled as a gift to man when God deems it the right time. Karista also gave me some poems from the Song of Songs to ponder on and I integrated this with the use of flowers to depict the woman or bride’s fragrance. Her fragrance is so unique amidst the many flowers that it awakens man from his slumber and intoxicates his being. It is in God’s design of them that He allows them to be drawn to the other. Karista and I decided to use contrasted colors, the woman in cooler colors and the man laying amidst warmer colors. They are very different in nature but yet they compliment each other and bring out the beauty of the other to make the picture whole. You can follow Christina on Instagram at @chasingbig_b. 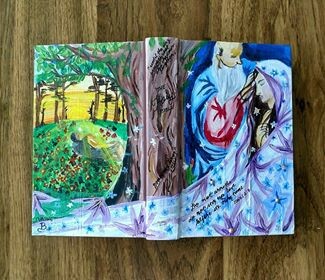 Just send her a direct message if you’d like to place an order for your very own personalized Bible cover.